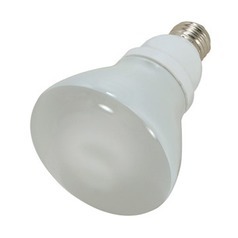 The following are detailed specifications about the 15-Watt R30 Reflector Compact Fluorescent Light Bulb. Medium base with frosted front cover. 5000K color temperature 82 CRI 650 lumens.Rated to last up to 10000 hours. The 5000k color temperature shows colors accurately and is great for reading and display uses. This 15-Watt R30 Reflector Compact Fluorescent Light Bulb is part of the $item.xCollectionName Collection from Satco Lighting. The following items are also part of the $item.xCollectionName Collection.